This is a collection of stuff. A stuff collection: specifically stuff I make, some stuff I grow, and stuff I like, among other stuff. Welcome to the Hundred Acre Wood! As promised, here are some of the details from Ben's first birthday party. We were blessed to have family and a few friends over to celebrate the day. My mom and step father were in town which is always exciting and a big deal since they come to us from California. My aunt came up from Atlanta. Many of Chris' relatives came from around the area. I've already shared a picture of Ben's special birthday outfit in my giveaway post, but I'll share more, because who can get enough of this??? 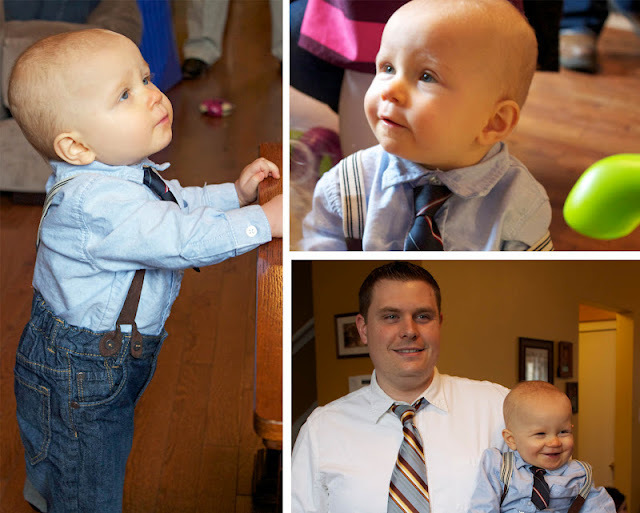 My best friend and his godmother, Sarah bought the jeans and suspenders from H&M. I had no idea that they even sold baby clothes, but I'm glad now that they do. I got a button down shirt to match and made a little neck tie from the skinny end of a regular tie. it was really a party for grown ups. but he didn't seem to mind at all. To be honest, he's such a ham, I'm convinced that he thinks everyday is a party starring him. We didn't do games or favors or anything like that, and he obviously needed some assistance with the unwrapping of gifts and blowing out of candles. The invitations I just put together on my computer and printed them off on some pre-cut paper from a wedding invitation kit that I found on clearance. 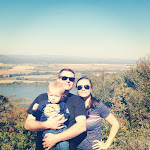 For more pictures and details on those, go here. For the decor, much of it I already had on hand, but even if I didn't, it's all inexpensive. The clouds are made of poster board and fishing line... about $2 all in all. The banner is colored paper (on clearance) from Joann's and jute rope (like you would use for a clothesline). The letters are printed on regular paper from a Word document and then pasted to the pennants. The total for this came to about $3. No harm, no foul. For the tablescape, I used burlap as a tablecloth. I found pine cones at the craft store after Christmas on clearance for 50 cents. They were, however, the cinnamon-scented ones, so I actually left them down in my basement for a long time to let the odor eek out a little. That stuff gives me a headache. I used the same colored paper from the banner and jute rope to make the food labels and then just used the pine cones as my card holders. For the food and drink, I tried to make as much of it "Winnie the Pooh" related as possible. 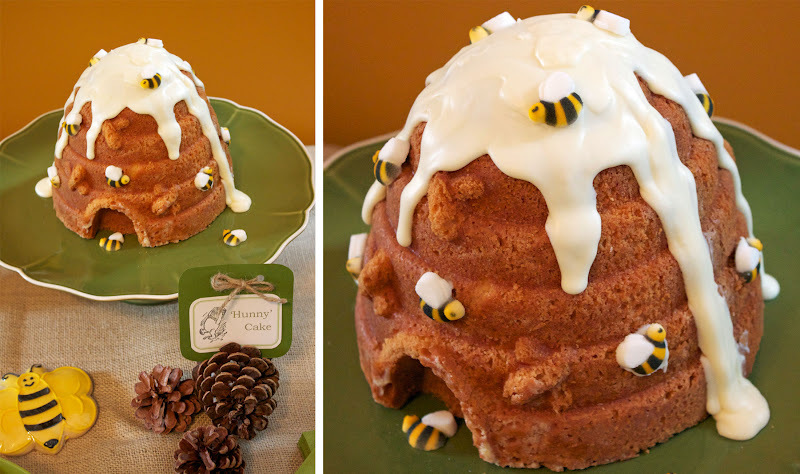 The 'Hunny' Cake was definitely the star. We used a beehive pan from Williams Sonoma. My aunt has made this cake so many times, she should be considered a professional. She stuck white store bought frosting in the microwave for a bit and it was the perfect consistency to pour over the top. She also brought the sugar bees for decoration which she ordered online. The Tigger Tails were easy as well. Although the chocolate did seize up on us a bit, we worked it out and they turned out pretty nicely. They're just pretzel rods dipped in white chocolate which we dyed orange with food coloring. Once those set a bit, we drizzled melted semi-sweet chocolate over the top. Fun to make. More fun to eat. My "Hundred Acre Wood Acorns" were Hershey's Kisses, Nutter Butter Bites, and mini chocolate chips, all "glued" together with melted chocolate. 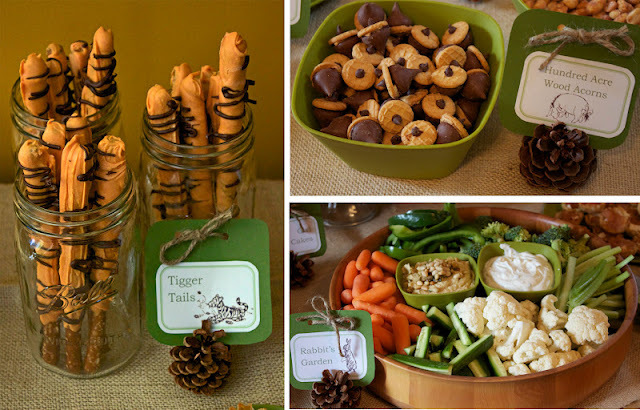 And "Rabbit's Garden" was your token veggie tray with hummus and dip. 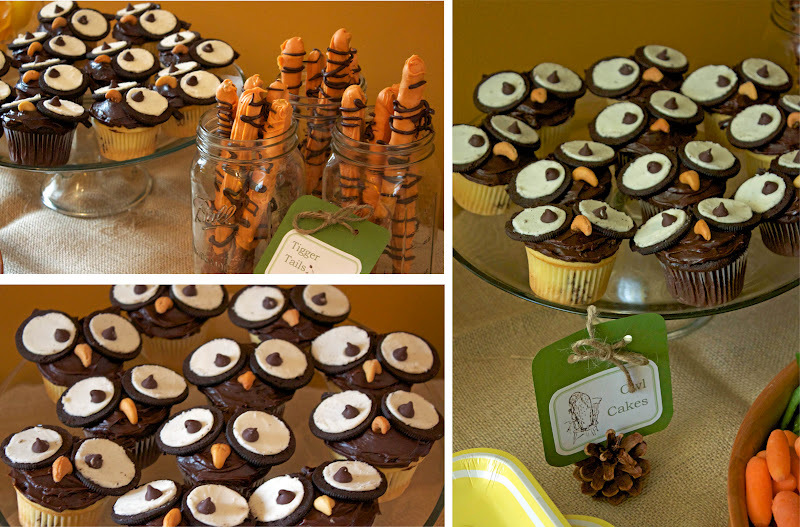 The owl cakes may be my personal favorite. I morphed two owl cupcake ideas that I found online to make these. Doesn't a cashew make the perfect beak? The eyebrows are chocolate-flavored licorice. The eyes are obviously Oreos with a chocolate chip for the pupil. So if you're ever making something with Oreo halves... get the real thing. Then, stick them in fridge for about 10 minutes. No more. No less. And don't use the freezer. Luckily it was worth it. So cute. and yellow paper straws that I bought for a steal off Etsy. 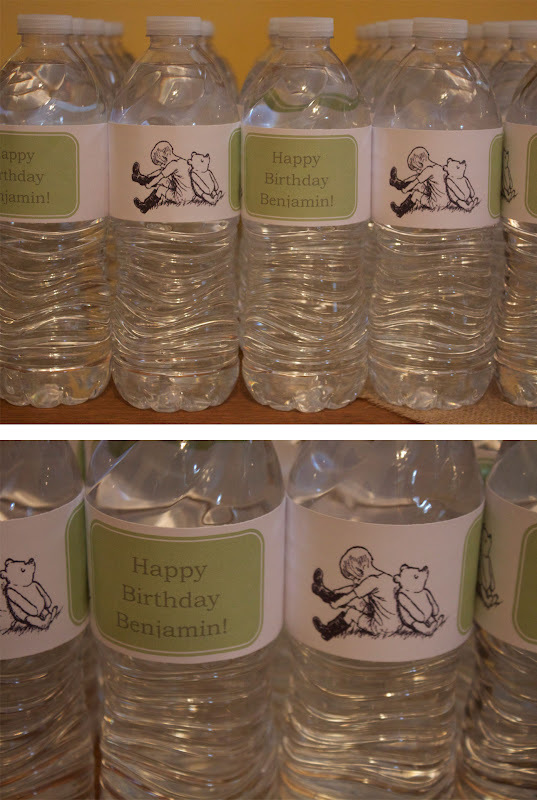 The water bottle labels I also made on my computer using regular paper and then just taped them on. Wow! How adorable! I especially love the beehive cake & your son's suspenders! wow, such a great job with everthing. i love the decorations and food. you are talented! he is going to look at these pictures so fondly. Holy cow! are you for hire with the labels and pinecones lol i am so not crafty and would pay you in a heartbeat! I was so thrilled to come across this! 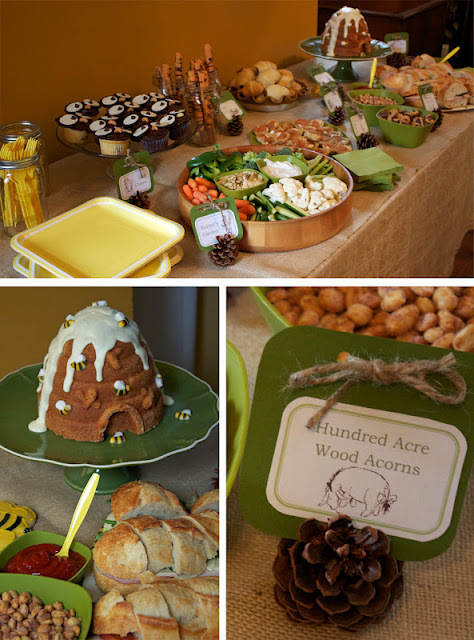 I am throwing a "Hundred Acre Wood" themed party for my soon-to-be one year old. You have some fantastic ideas!Thanks for the inspiration! Your son is adorable, too! I saw your page on Pinterest! I just love those clouds! I had to repin them on my pooh party board! I hope you still check your blog. I love your table display and the food name display. How did you do them? Did you have a template for your designs? Where did you find the pooh images? I loved your arrangements ,you did a fantabulus job. I am a mother of 2 boys ,elder 3 and younger 1 and both share the same date of birth miraclously ... i too am planning to have a grand beary celebration but i cant find a beehive cake mold anywhere even at William Sonoma . So i was thinking if you want to sale it . I would really appreciate if you can reply me soon since there birthday is on 1st feb. Thanks for your kind words. I, unfortunately, no longer have the pan, and I know that Williams Sonoma stopped carrying it awhile ago. However, I also know for a fact that Nordicware, the manufacturer, still makes them, and they are available online. I would recommend checking Amazon. This is so so amazing! My Daughter is turing 3 in a few months and she LOVES Pooh so I will be stealing a lot of these ideas! You can buy orange chocolate, but if you have to dye white chocolate use oil based food coloring. Regular food coloring is water based and could seize up the chocolate, making it very hard to use. Merkins chocolate candy coating is a good brand. Wow, this is amazing theme idea. I appreciate all these efforts that been put to organize this sun bash. 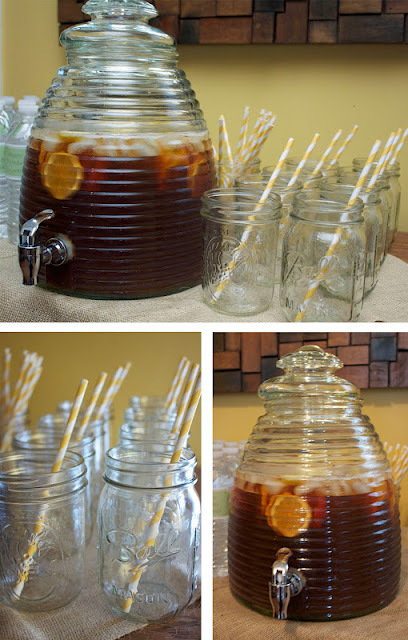 My sister is expecting and I was seeking ideas for her baby shower that I would host at local venues in Houston. I am sure this one would be best for her shower. 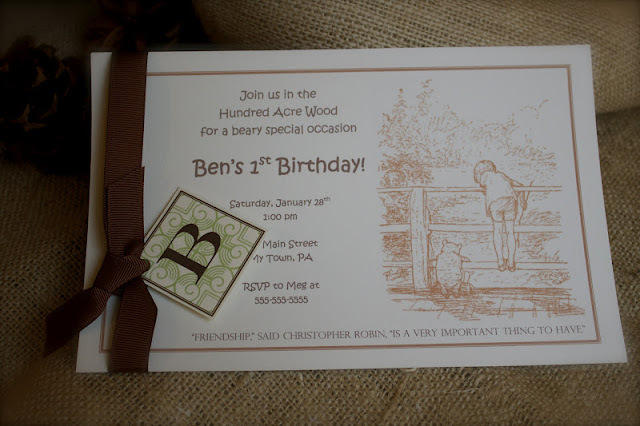 Hello, I just found this older, but lovely, post, while looking for ideas on a similar party (daughter's 3rd birthday). Can you please tell me more about the apple brie bites? What thing on the table is that, and how are they made? Sounds amazing! Please leave your feedback! I would love to hear what you have to say. If you are entering a comment for a giveaway, please be sure to post a comment for EACH entry where more than one entry qualify. Thanks! I am Meg. I paint, sew, craft, garden, preserve, repurpose, and redesign. This is a collection of my stuff! Freezer Meal Recipe Round Up! All are welcome to use a picture from my blog, but please link back to my page and give credit where it is due. All projects on my page are made entirely by me unless otherwise stated.